When you walk through the forest or the city, do you usually look up? The usual thing is to look at where we are going or where we put our feet, but if you find yourself in the middle of nature, do not forget to observe the trees, perhaps you find yourself with an image as beautiful as the cover of this post: you are observing the crown shyness. Less than 100 years ago, back in 1920, a botanical phenomenon that give us beautiful and impressive images of certain forests was observed for the first time. In 1955, the botanist Maxwell R. Jacobs, described this phenomenon as “crown shyness” after studying various populations of eucalyptus. The crown shyness is also known as canopy disengagement, canopy shyness or intercrown spacing. This phenomenon consists in a limited growth of the canopy of the trees, in such a way that the leaves and branches of adjacent trees do not touch each other. This produces figures and patterns with the sky in the background when the trees are observed from the ground. The canopy disengagement, among other themes, is explored in the documentary Once Upon a Forest. The initial hypothesis of Maxwell R. Jacobs (currently barely accepted by the scientific community) explains that the friction of some branches with others, when the wind hits them, would limit the growth of the branches to avoid touching the neighboring trees, due to the damages produced by the abrasion. The most supported hypothesis currently indicates that crown up has an allelopathic origin. In botany, allelopathy is any effect that one plant transmits to another through the production of different chemical compounds, either causing a positive or negative effect on the other plant. These compounds are the so-called allelochemicals. In other words, plants and trees communicate with each other by chemical signals. This relationship occurs more frequently between trees and plants of the same species, although it also occurs between different species. To know in depth the process of allelopathy, we invite you to read the post Communication among plants: allelopathy. In addition to chemical signals, phytochrome photoreceptors (sensors of light capable of detecting the area of distant red light) possessed by trees and plants allow them to perceive the proximity of other individuals. Another type of photoreceptor detects blue light, which produces in plants and trees the avoidance of shadows produced by other individuals. As a whole, the signals captured by these photoreceptors would provoke the response of the tree to move away from the adjacent one, which would allow it to obtain a greater quantity of light, which is essential for photosynthesis. Crown shyness has been observed in certain European oak and pine species and tropical and subtropical species, such as some eucalyptus, species of the Dryobalanops genus, Pinus contorta, Avicennia germinans, Didymopanax pittieri, Clusia alata, Celtis spinosa, Pterocymbium beccarii, Picea sitchensis and Larix kaempferi. In other species, the tops of the trees come to touch and even cross their branches, although the canopy (habitat that includes the tops of the trees) does not usually mix completely. It allows a greater penetration of light in the forest to perform photosynthesis more efficiently. 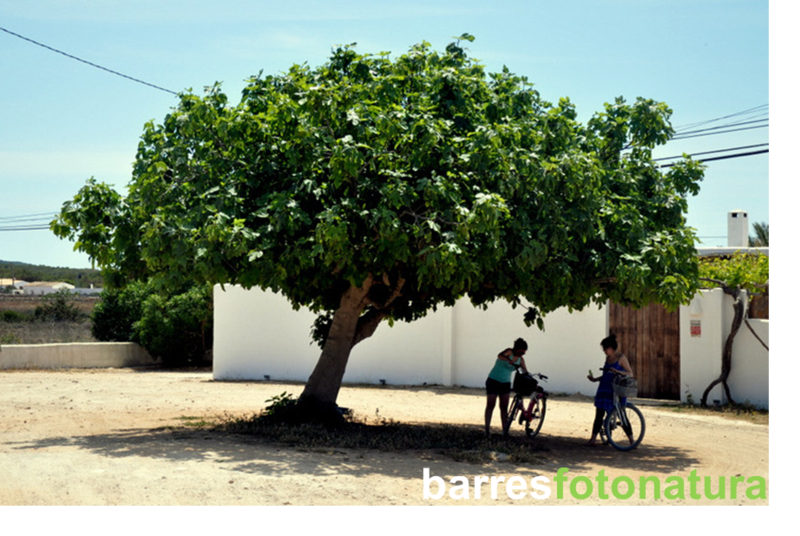 It avoids damaging the branches and leaves when hit against each other in case of storm or gusts of wind. It prevent diseases, larvae and insects that feed on leaves from spreading easily from one tree to another. For now, it seems that crown shyness is due to a relationship of collaboration between species for survival, rather than a competition (the popularly known as the “survival of thje fittest”). We will have to wait for future studies to shed a little more light on this still unknown phenomenon. During million years the evolution leaded plants to develop different strategies to defence from natural enemies, giving rise to an evolutionary weaponry war in which the survival of ones and others depends into the ability to beat the other’s adaptations. It is in that scenario where the high-level accumulation of heavy metals in plants plays an important role. chemical: different organic and inorganic components. visual: crypsis and mimicry . behavioural: related with phenology’s modification. and associative: symbiosis with other organisms, such is the case of the genus Cecropia, which has stablished a symbiotic relationship with ants of the genus Azteca, who protects these plants – to know more: Plants and animals can also live in marriage-. Mechanic defence with thorns (Author: Karyn Christner, Flickr, CC). It is known that chemical defence is ubiquitous, and thus, a lot of interactions among organisms can be explained for this reason. In this sense, some plants contains high levels of certain chemical elements, frequently metals or metallic components, which plays an important role in the defence, these plants are the heavy metal hyperaccumulating plants. This plants belong to several families, thus hyperaccumulation is an independent acquisition occurring different times during the evolution. In all cases, hyperaccumulation allowed the ability to grow soils with high levels of heavy metals and to accumulate extraordinary amounts of heavy metals in aerial organs. It is known that the concentration of these chemical elements in hyperaccumulating plants can be 100 – 1000 times higher than in non-hypperaccumulating plants. Generally, chemistry describes heavy metal as transition metals with atomic mass higher than 20 and with a relative density around 5. But, from a biological point of view, heavy metals or metalloids are elements which can be toxic in a low concentration. Even though, hyperaccumulating plants has become tolerant, i.e., they hypperacumulate this heavy metals without presenting phytotoxic effects (damage in plant tissues due toxicity). Increased absorption rate of heavy metals. Roots that perform translocation more quickly. Great ability to detoxify and accumulate heavy metals in sheets. Thus, hyperaccumulating plants are prepared to assimilate, translocate and accumulate high-levels of heavy metals in vacuoles or cellular wall. In part, it is due to the overexpression of genes codifying for membrane transporters. or > 0,1 mg·g-1 (0,01%) of Cd. Minuartia verna, copper hyperacumulating plant (Autor: Candiru, Flickr, CC). Tolerance and presence of metals in soils. Interference with other neighbouring plants. The most supported hypothesis is “Elemental defence”, which indicates that certain heavy metals could have a defensive role against natural enemies, such as herbivores and pathogens. So, in the case these organisms consume plants, they should present toxic effects, which would lead them to die or at least to reduce the intake of this plant in future. Even though heavy metals can act through their toxicity, this does not guarantee plants will not be damaged or attacked before the natural enemy is affected by them. For this reason, it is still necessary a more effective defence which allow to avoid the attack. In contrast, according to a more modern hypothesis, the “Joint effects”, heavy metals could act along with other defensive organic components giving rise to a higher global defence. The advantages of inorganic elements, including heavy metals, are that they are not synthetized by plants, they are absorbed directly from the soil and thus a lower energetic cost is invested in defence, and also they cannot be biodegraded. Even though, some natural enemies can even avoid heavy metal effects by performing the chelation, i.e., using chelators (substances capable of binding with heavy metals to reduce their toxicity) or accumulating them in organs where their activity would be reduced. This modern hypothesis would justify the simultaneous presence of several heavy metals and defensive organic components in the same plant, with the aim to get a higher defence able to affect distinct natural enemies, which would be expected to do not be able to tolerate different element toxicity. Thlaspi caerulescens, zinc hyperaccumulating plant (Autor: Randi Hausken, Flickr, CC). On the other hand, it has been shown that certain herbivores have the ability to avoid the intake of plants with high levels of heavy metals, doing what is called “taste for metals“. Although this is known to occur, the exact mechanism of this alert and avoidance process is still uncertain. Solanum nigrum, cadmium hyperaccumulating plant (Autor: John Tann, Flickr, CC). Additionaly, even tough heavy metal concentration in plant are really high, some herbivores manage to surpass this defense by being tolerant, i.e., their diet allows them to intake high dosis of metals and, thus, consume the plant. This could lead to think some herbivores could become specialist in the intake of hyperaccumulating plants, and, thus, this type of defence would be reduced to organisms with varied diets, which are called generalists. It has been demonstrated to not be true, as generalists herbivores sometimes present a higher preference and tolerance for hyperaccumulating plants than specialist organisms. For all these reasons, it can be said that evolution is still playing an important role in this wonderful weaponry war. Boyd, R., Davis, M.A., Wall, M.A. & Balkwill K. (2002). Nickel defends the South African hyperaccumulator Senecio coronatus (Asteraceae) against Helix aspersa (Mollusca: Pulmonidae). Chemoecology 12, p. 91–97. Boyd, R. (2007). The defense hypothesis of elemental hyperaccumulation: status, challenges and new directions. Plant soil 293, p. 153-176. Boyd, R. (2012). Elemental Defenses of Plants by Metals. Nature Education Knowledge 3 (10), p. 57. Laskowski, R. & Hopkin, S.P. (1996). Effect of Zn, Cu, Pb and Cd on Fitness in Snails (Helix aspersa). Ecotoxicology and environmentak safety 34, p. 59-69. Marschner, P. (2012). Mineral Nutrition of Higher Plants (3). Chennai: Academic Press. Noret, N., Meerts, P., Tolrà, R., Poschenrieder, C., Barceló, J. & Escarre, J. (2005). Palatability of Thlaspi caerulescens for snails: influence of zinc and glucosinolates. New Phytologist 165, p. 763-772. Prasad, A.K.V.S.K. & Saradhi P.P. (1994).Effect of zinc on free radicals and proline in Brassica and Cajanus. Phytochemistry 39, p. 45-47. Rascio, N. & Navari-Izzo, F. (2011). Heavy metal hyperaccumulating plants: How and why do they do it? And what makes them so interesting?. Plant Science 180 (2),p. 169-181. Shiojiri, K., Takabayashi, J., Yano, S. & Takafuji, A. (2000) Herbivore-species-specific interactions between crucifer plants and parasitic wasps (Hymenoptera: Braconidae) that are mediated by infochemicals present in areas damaged by herbivores. Applied Entomology and Zoology 35, p. 519–524. Solanki, R. & Dhankhar, R. (2011). Biochemical changes and adaptive strategies of plants under heavy metal stress. Biologia 66 (2), p. 195-204. Verbruggen, N., Hermans, C. & Schat, H. (2009). Molecular mechanisms of metal hyperaccumulation in plants. New Phytologist 181 (4), p. 759–776. Wenzel, W.W. & Jockwer F. (1999). Accumulation of heavy metals in plants grown on mineralised soils of the Austrian Alps. Environmental pollution 104, p. 145-155. When we think about the life of plants it is difficult to imagine without interaction with the animals, as they establish different symbiotic relationships day after day. These symbiotic relationships include all the herbivores, or in the contradictory way, all the carnivorous plants. But there are many other super important interactions between plants and animals, such as the relationships that allow them to help each other and to live together. So, this time I want to present mutualism between plants and animals. And, what is mutualism? it is the relationship established between two organisms in which both benefit from living together, i.e., the two get a reward when they live with the other. This relationship increase their biological effectiveness (fitness), so there is a tendency to live always together. According to this definition, both pollination and seed dispersal by animals are cases of mutualism. Let’s see. Many plants are visited by animals seeking to feed on nectar, pollen or other sugars they produce in their flowers and, during this process, the animals carry pollen from one flower to others, allowing it reaches the stigma in a very effective way. Thus, the plant gets the benefit of fertilization with a lower cost of pollen production, which would be higher if it was dispersed through the air. And the animals, in exchange, obtain food. Therefore, a true relationship of mutualism is stablished between the two organisms. The extreme mutualism occurs when the species evolve depending on the other organism, i.e., when there is coevolution. We define the coevolution such as these evolutionary adaptations that allow two or more organisms to establish a deep relationship of symbiosis, due that the evolutionary adaptations of one specie influence the evolutionary adaptations of another organism. For example, this occurs between various orchids and their pollinators, as is the well- known case of Darwin’s orchid. But there are many other plants that also have co-evolved with their pollinators, as a fig tree or cassava. In no way, this should be confused with the trickery produced by some plants to their pollinators, that is, when they do not obtain any direct benefit. For example, some orchids can attract their pollinators through odours (pheromones) and their curious forms that resemble female pollinator, stimulating them to visit their flowers. The pollinators will be impregnated with pollen, which will be transported to other flowers due to the same trickery. Bee orchid (Ophrys apifera) (Autnor: Bernard DUPONT, flickr). The origin of seed dispersal by animals probably had occurred thanks to a co-evolutionary process between animals and mechanisms of seed dispersal in which both plants and animals obtain a profit. The most probably is that this process began in the Carboniferous (~ 300MA), as it is believed that some plants like cycads developed a false fleshy fruits that could be consumed by primitive reptiles that would act as seed dispersers. This process could have intensified the diversification of flowering plants (angiosperms), small mammals and birds during the Cretaceous (65-12MA). The mutualism can occur in two ways within the seed dispersal by animals. The first case is carried out by animals that eat seeds or fruits. These seeds or some parts of the fruits (diaspores) are expelled without being damaged, by defecation or regurgitation, allowing the seed germination. In this case, diaspores are carriers of rewards or lures that result very attractive to animals. That is the reason why fruits are usually fleshy, sweet and often have bright colours or emit scents to attract them. For example, the red-eyed wattle (Acacia cyclops) produces seeds with elaiosomes (a very nutritive substance usually made of lipids) that are bigger than the own seed. This suppose an elevated energy cost to the plant, because it doesn’t only have to produce seeds, as it has to generate the award too. But in return, the rose-breasted or galah cockatoo (Eolophus roseicapillus) transports their seeds in long distances. Because when the galah cockatoo eats elaiosomes, it also ingest seeds which will be transported by its flight until they are expelled elsewhere. On the left, Galah cockatoo (Eolophus roseicapillus) (Autnor: Richard Fisher, flickr) ; On the right, red-eyed wattle’s seeds (black) with the elaiosome (pink) ( Acacia cyclops) (Autnor: Sydney Oats, flickr). And the other type of seed dispersal by animals that establishes a mutualistic relationship occurs when the seeds or fruits are collected by the animal in times of abundance and then are buried as a food storage to be used when needed. As long as not all seed will be eaten, some will be able to germinate. Plants of the genus Cecropia live in tropical rain forests of Central and South America and they are very big fighters. The strategy that allow them to grow quickly and capture sunlight, avoiding competition with other plants, resides in the strong relationship they have with Azteca ants. Plants provide nests to the ants, since their stems are normally hollow and with separations, allowing ants to inhabit inside. Furthermore, these plants also produce Müllerian bodies, which are small but very nutritive substances rich in glycogen that ants can eat. In return, the ants protect Cecropia from vines and lianas, allowing them to success as a pioneer plants. Few years ago, an interesting plant has been discovered in Cuba. This plant is pollinated by bats, and it has evolved giving rise to modified leaves that act as satellite dish for echolocation performed by these animals. That is, their shape allow bats to locate them quickly, so they can collect nectar more efficiently. And at the same time, bats also pollinate plants more efficiently, as these animals move very quickly each night to visit hundreds of flowers to feed. In general, we see that the life of plants depends largely on the life of animals, since they are connected in one way or another. All the interactions we have presented are part of an even larger set that make life a more complex and peculiar one, in which one’s life cannot be explained without the other’s life. For this reason, we can say that life of some animals and some plants resembles a marriage. Bascompte, J. & Jordano, P. (2013) Mutualistic Networks (Chapter 1. Biodiversity and Plant-Animal Coevolution). Princeton University Press, pp 224. Dansereau, P. (1957): Biogeography: an Ecological Perspective. The Ronald Press, New York., pp. 394. Fenner M. & Thompson K. (2005). The Ecology of seeds. Cambridge: Cambridge University Press, 2005. pp. 250. Izco, J., Barreno, E., Brugués, M., Costa, M., Devesa, J. A., Fernández, F., Gallardo, T., Llimona, X., Parada, C., Talavera, S. & Valdés, B. (2004) Botánica ªEdición. McGraw-Hill, pp. 906. Murray D. R. (2012). Seed dispersal. Academy Press. 322 pp. Tiffney B. (2004). Vertebrate dispersal of seed plants through time. Annual Review of Ecology, Evolution and Systematics. 35:1-29. Willis, K.J. & McElwain, J.C. (2014) The Evolution of Plants (second edition). Oxford University Press, pp. 424. Has anyone ever seen a fig flower? Surely even if you really look for it, you will not find any of them. In fact, neither Linnaeus, the great Swedish botanist, could discover the enigma of fig flowers and when he described the species and gave him a scientific name (Ficus carica L.), he said the fig had no flowers! But then how does the fig reproduce himself and origins its delicious summer fruit; the fig? The flowers of the fig tree cannot be seen as they grow hidden inside the receptacle that supports them, the fig. They have developed a close relationship of mutualism with their pollinators so they don’t need to bloom externally offering sweet rewards. Indeed, each species of Ficus (including 750 species in family Moraceae) is pollinated by a unique wasp species (family Agaonidae; Blastophaga psenes in the case of the Mediterranean fig). It is a very complex case of coevolution between a plant and its pollinator in which neither species could survive without the other. The mechanism of fig pollination works as a perfect gear. Female wasps are the first to visit the fig, where they arrive attracted by the smell of the mature female flowers. The female wasps possess special adaptations to penetrate the fig and achieve their ultimate goal: to leave their eggs inside. They have inverted teeth in the jaws and special hooks in the legs that let them to advance into the fruit. However, they have only one opportunity to deposit their eggs since most wasps lose their wings and antennae once they have entered the fig and therefore can no longer look for another. Once the eggs hatch, the wasp larvae feed on the contents of the fig. The male wasp larvae are the first to complete its development and when they reach sexual maturity, they seek female wasps, fertilize them and die inside the fig. The female wasps leave the figs a few days later, coinciding with the male flowers maturation and thus favoring that their exit will be carrying pollen. These fertilized and full of pollen wasps will look for a fig fruit again where to leave the pollen and eggs. Then the cycle begins again. Open fig with its pollinator wasp (Foto: Royal Society Publishing). IS IT THE FIG ACTUALLY A FRUIT? 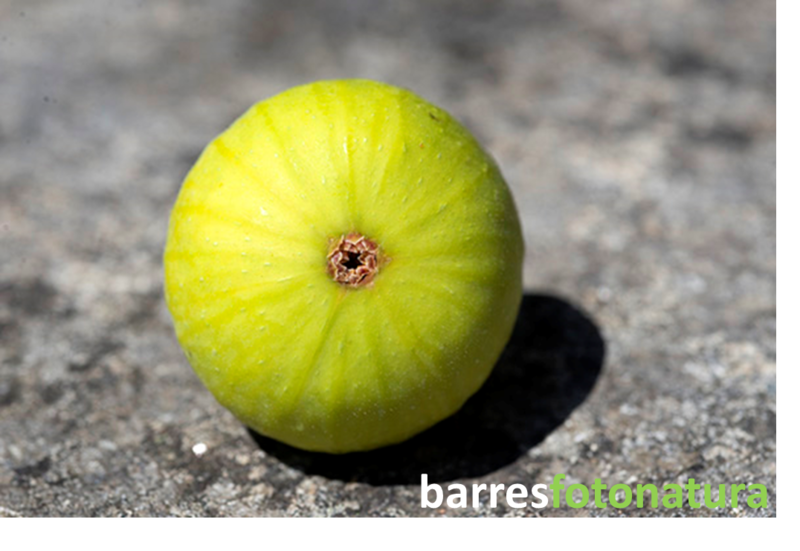 The fig is actually an infructescence (an ensemble of fruits that act as a single unit to facilitate the dispersion) with a special morphology called syconium. The syconium is a type of pear-shaped receptacle, thickened and fleshy with a small opening, the ostiole, that allows the entry of pollinators. Both male and female flowers (fig is monoecious) are together in the syconium, enveloped by bracts (white filaments found in the fig), but each one maturates in different time to avoid autopollination. Once the flowers are fertilized, the fruits originate within the same structure, thus flowers and fruits mix up. WHERE DO THE FIGS COME FROM? Who would have said that the fig tree would have a so complex fructification mechanism? In fact, the fig tree is native to Asia but is now naturalized in the Mediterranean since prehistoric times. There is evidence of its consumption and cultivation from the Neolithic. The fig tree is considered as one of the first plants cultivated by mankind. In spring it produces fertilized figs (breba), increasing its production with two harvests per year. 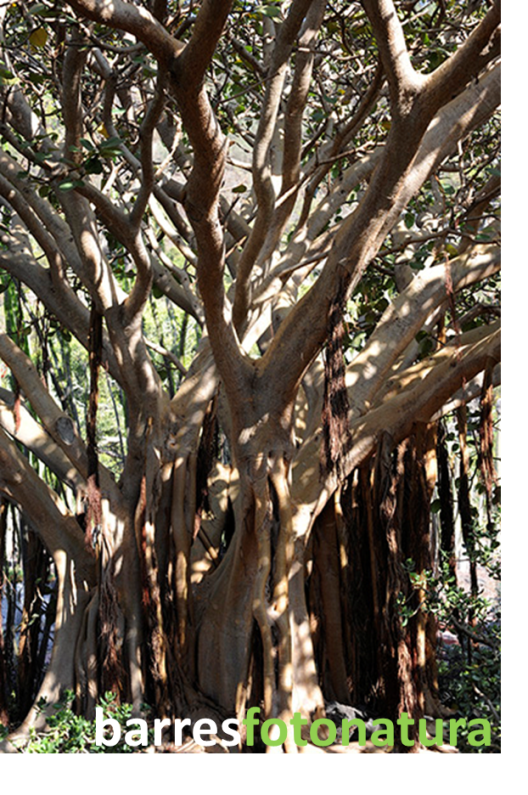 Main Ficus species grow in tropical climates. In temperate areas, some of this species were brought for its interest in gardening. Many cities have grown these giants in their public gardens because their dramatic appearance. They can reach up to 30 meters high and they develop aerial roots that end up reaching the ground acting as buttress that hold their weight. 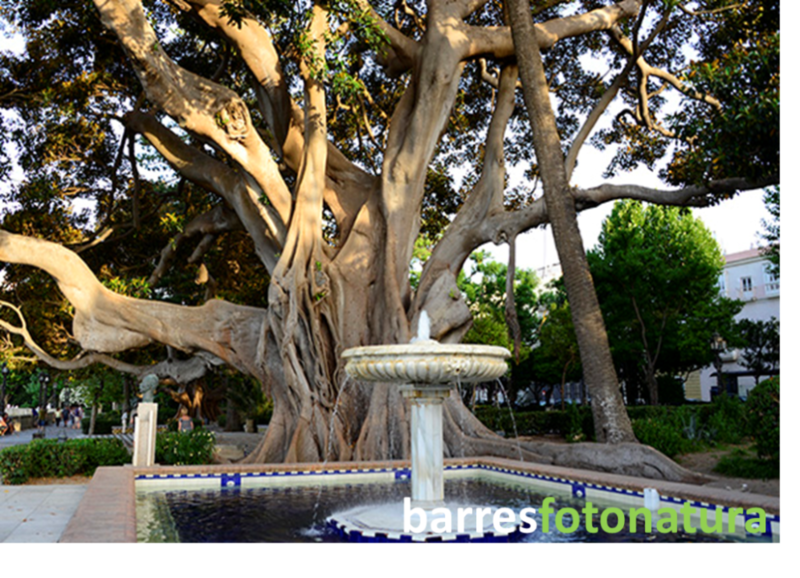 The have become unique elements of our urban landscape; such as in the Parque Genovés, Cadiz or the magnificent specimen of Ficus rubiginosa located in the Botanic Garden of Barcelona. Byng W (2014). The Flowering Plants Handbook: A practical guide to families and genera of the world. Plant Gateway Ltd., Hertford, UK. Cruaud A, Cook J, Da-Rong Y, Genson G, Jabbour-Zahab R, Kjellberg F et al. (2011). Fig-fig wasp mutualism, the fall of the strict cospeciation paradigm? In: Patiny, S., ed., Evolution of plant-pollinator relationships. Cambridge: Cambridge University Press, pp. 68–102. Machado CA, Robbins N, Gilbert MTP & Herre EA (2005). Critical review of host specificity and its coevolutionary implications in the fig/fig-wasp mutualism. Proceedings of the National Academy of Sciences of the USA 102: 6558–6565. Ramirez WB (1970). Host specificity of fig wasps (Agaonidae). Evolution 24: 680–691. Serrato A & Oyama K (2012). Ficus y las avispas Agaonidae. ContactoS 85: 5–10.